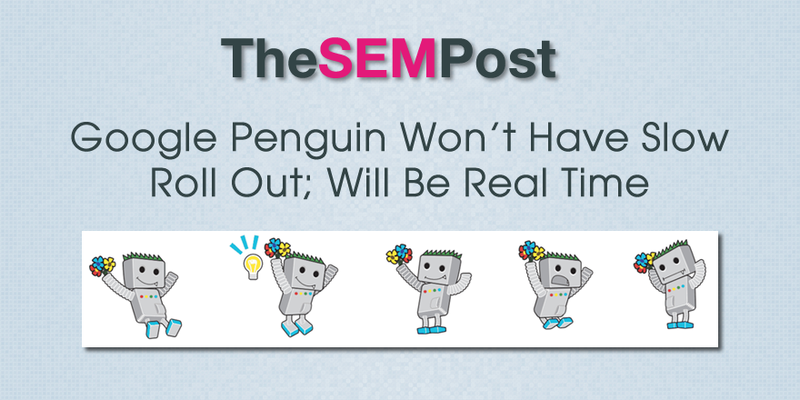 The upcoming Google Penguin update will not have a slow roll out, according to Gary Illyes from Google. And he confirmed again that it will be the real time version of Penguin that is released. nope, this will be the real-time version. There had been some concern that Penguin might share a similar slow rollout to Panda, as they brought it up to . And for those impacted by Penguin, the idea of a slow roll out could mean that some webmasters wouldn’t know if their sites recovered, or if they were still waiting on a roll out. Many SEOs haven’t been a fan of the slow roll out of Panda, both because it is harder to track what might have changed in the Panda algo, but also because it makes gauging a Panda recovery – or hit – harder. So the fact Penguin won’t have the same kind of slow roll out is good news. We still don’t have a confirmation on when Penguin will roll out… but everyone is .